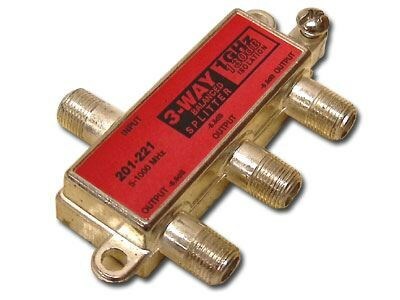 Coaxial Splitter - CATV F-Type - 3 Way - Balanced - 1GHz 130dB. This 3-Way 1GHz 130dB F Splitter is suitable for Cable TV (CATV) or antennae applications or any RF distribution from 5 to 1000 MHz at a frequency of 75-Ohms. These Splitters have an anti-corrosion Tin plated Zinc-Alloy die cast housing and high performance printed-board circuitry to ensure maximum quality. This Splitter also has a soldered back cover.